I’ve been thinking lately of the idea of style uniforms, and how our adult style, our personal style, if you will, evolves. Of course this is because my uniform for the past week has been leggings or pyjama bottoms, and a loose, soft tee. So no style, and no brassiere. Because of a painful shingles rash, I haven’t even been able to consider wearing a bra. And this reminded me of the early-seventies, when barely a year after I needed to wear a bra, I stopped wearing one. The irony is that I’d been so delighted when I actually needed a bra. In fact, I wore one needlessly for two years just because everyone else had one. 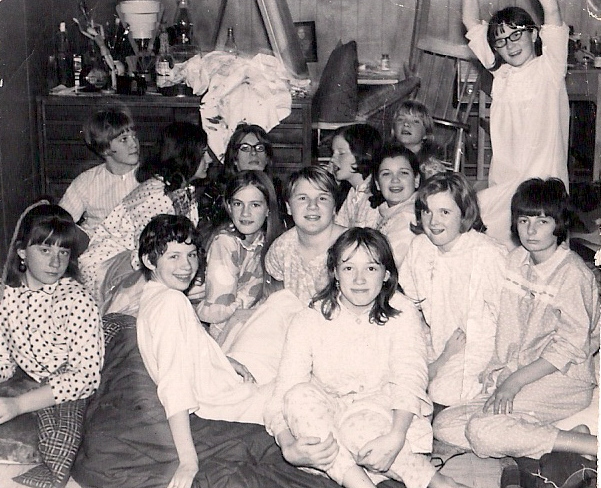 I remember telling my mum tearfully that I simply couldn’t attend my friend Mary’s pyjama party in grade seven and be the only girl wearing an undershirt. Ha. I remember junior high and high school as the time when I began to learn who I was becoming as a person. And I remember experimenting with clothes, using outfits as a means to demonstrate who I was, or who I wanted be be, at any rate. I remember a long, yellow, flowered peasant dress, or granny dress as we called them. A fabulous pair of faded, flared jeans that I inherited from my sister Connie. She had sewn beautiful flowered inserts into the hem. This was a clever way of fixing jeans that had become too short. And luckily for me, too small as well. I think my clearest outfit memory is of a beloved, grey suede bomber jacket that I bought with my own money. My friend bought a brown one. We wore them with our jeans and turtlenecks, with polka dot cotton handkerchiefs, filched from my step-father’s drawer, tied around our necks like scarves. My friend refused to wear her “scarf,” though, after she saw an old man on the bus blowing his nose into an identical one. Ha. I think that outfit was the beginning of my lifelong love for jackets and jeans. In fact, when I won a khaki suede jacket a couple of years ago on Alyson Walsh’s blog That’s Not My Age, I was thrilled. Wearing it was kind of like stepping back in time. Minus the mop of hair. Ha. But, back to bras, or rather the absence of bras, and pushing boundaries. I can’t remember if I refused to wear a bra to school that year, or not. In fact, I can’t remember if there was a dress code by the time I was in high school. I certainly never heard of a student being sent home for being dressed inappropriately. But there was a strict dress code when I was in elementary school, and everyone my age in my hometown remembers its demise. We all remember the girl whose mum sent her to school in slacks, or trousers, one frigid winter morning in 1970. This in an era, at least in New Brunswick, when girls had to wear skirts or dresses to school. The girl was sent home several times. But the mum persisted, and finally the school board relented, and we had a new policy: girls could wear pants. And a year or so later, we could even wear jeans. I still remember when I discovered that this trail-blazer was the older sister of a friend. “That was YOUR sister? I murmured, reverently. She was our hero. Most schools in Canada, which don’t require uniforms, have dress codes of some type. A dress code being a policy which attempts to define what “cannot be worn to school” by students, as opposed to a uniform which clearly stipulates “what must be worn.” Of course, dress codes are famously difficult to enforce, often engendering all kinds of protest from students and parents when a student is chastised for “dressing inappropriately.” As teachers, we all groaned every spring when the issue of dress codes would rear its head with the arrival of the hot weather. Dress codes are such a dicey issue for teachers and school administrators. As a high school teacher I remember dreading having to make the call whether a student’s clothing was too revealing or not. That’s a minefield, people. So many parts of dress codes are open to interpretation: too short, or too tight being relative terms. And I did NOT want to be the vice-principal who had to have “the talk” with a student about their “inappropriate” outfit. You see, here’s what bothered me and many of my colleagues about dress codes. It’s always the girls who get the talk. The contentious part of dress codes is the focus on “revealing clothing” which always targets girls. And often girls who are larger, who cannot find fashionable, well-fitting clothes as easily as smaller girls. Fast fashion stores, where most teenagers can afford to shop, do not cater to anyone who is larger than a size 10. So what is a teenager who is larger than a size 10, but who wants to look cool like her friends supposed to do? I had to turn the radio off in exasperation last spring when on a call-in show on the subject of dress codes, an irate parent said her daughter was being “victimized” for showing up to school in a tank top with spaghetti straps. Tops with spaghetti straps being one of the most recent articles of clothing deemed “inappropriate.” She said her daughter should be able to wear the top because she “is tiny” and “looks adorable in it.” But to me the subtext of her argument was that if her daughter were heavy, the criticism would be justified. I remember I shouted at the radio, “Lady, can you hear yourself?” And then I switched it off. Phew. Easy for me to remove myself from the argument now that I’m retired. Then there’s the crop top controversy at a school in southern Ontario. One news photo had a shot of kids posing together when they showed up for school all wearing “crop tops” to protest their friend being sent home for wearing one. In response to that I will say there are crop tops and there are…well… sports bras. I remember my mum was not thrilled when I stopped wearing a bra under my tops, but I wonder what she might have said if I’d tried to leave the house in only my bra. Ha. One angry mum writing about the controversy wrote that if schools want to have a dress code, they should just go with school uniforms and be done with it. Well, now that’s a whole other can of worms, my friends. And one which Todd DeMitchell, Professor of Education at the University of New Hampshire says is not as cut and dried as everyone seems to think. That despite claims that school uniforms promote inclusion, identity, and discipline, the data shows that they are not the panacea that they might appear to be. He says schools should be wary of “easy” solutions. You can read his well researched article on the subject here if you’re interested. And here’s my point. I think it’s good for kids to have the freedom to push boundaries. Go braless. Or try to get away with wearing their bra to school. How do kids learn to navigate the complex adult world if they don’t get a taste of that complexity in school? How do they learn to make their own decisions if adults make all the decisions for them, even down to their clothing choices? As much as I groaned as a teacher when the short shorts and tank tops appeared with the May sunshine, I also remember my own fifteen year old rebellion. I remember all my terrible outfit choices, the long, long flared jeans with the ripped up hems, the cropped sweaters my mum hated, the dreadful platform shoes. But I also remember navigating style choices and beginning to decide what worked for me and what didn’t. I remember developing a personal style, some parts of which have evolved into my own style uniform, and which remain unchanged, even today. Even at age 62. And if I’d been fifteen during that crop top controversy at that school in southern Ontario, I’d have been right there with my friends proudly wearing my crop top, irate at the adults for daring to limit our freedom of expression. The drama of youth, eh? At least I’d have worn my crop top, or sports bra, until I had to catch my bus. Then I’d be pulling on something more suitable before I got home. And if I were sent home for what I was wearing, I’m certain that my mum would NOT have been calling on-line radio shows to say I was being victimized for breaking the rules. I might have pushed some boundaries when I was fifteen, but I always toed the line at home. Okay… maybe not always… but I WAS always happier if my mum never found out. 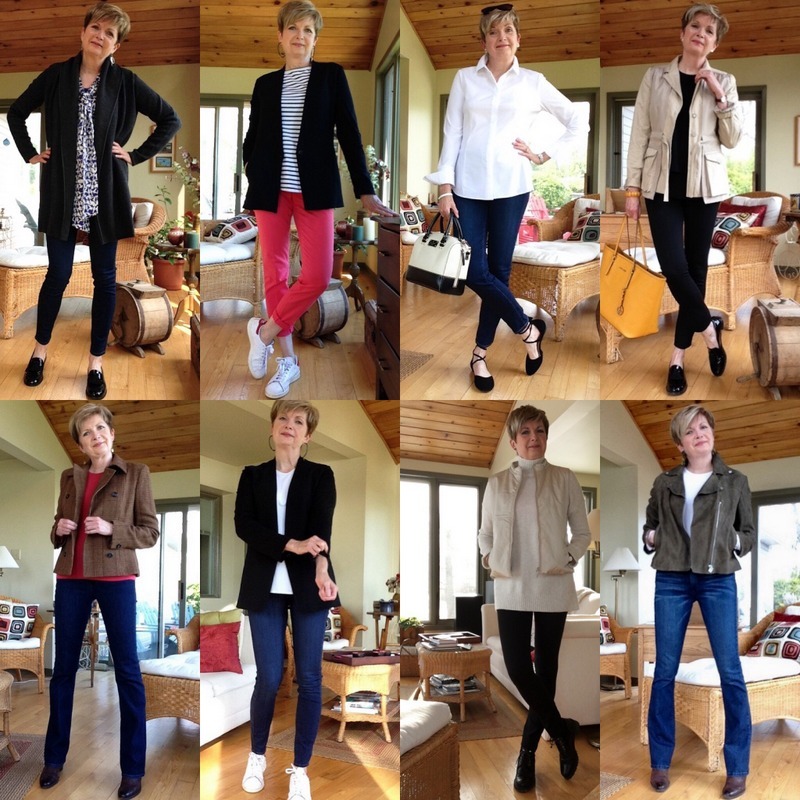 The evolution of personal style: variations on a theme. P.S. I just wanted to add that it wasn’t my intention to open up debate about whether school uniforms are a good idea or not. I’m not against them. I never attended a school myself, nor did I teach at a school, where the students wore uniforms. But according to everything I read in putting together this post, the data doesn’t support what we think we all know about school uniforms. I thought that was interesting. Now, let’s hear from you, my friends. Whether you wore a uniform to school, or didn’t… how do you think your personal style evolved? Just sayin’. Thoughts About Grief. 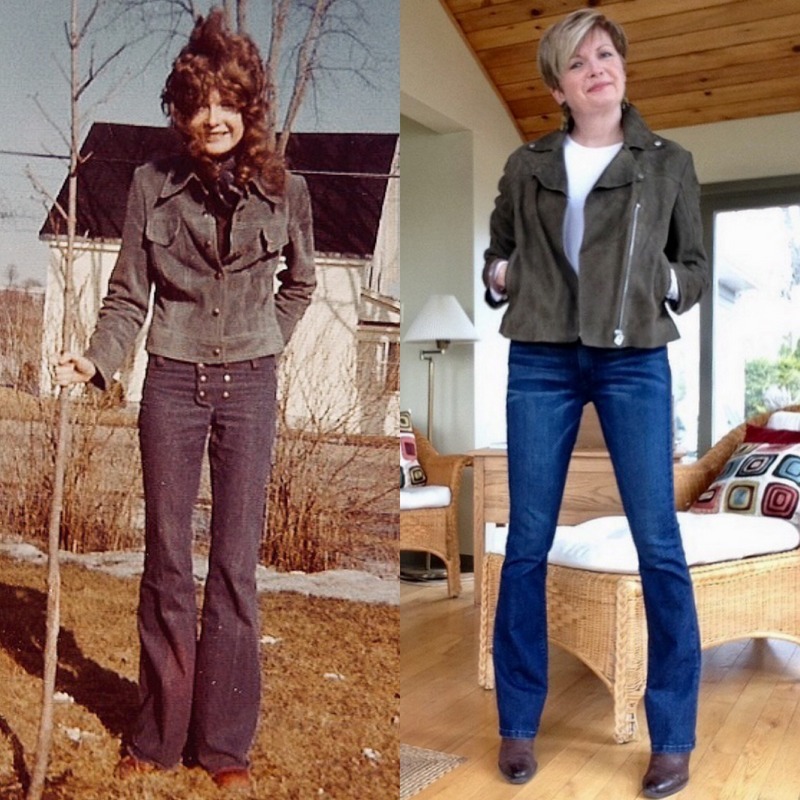 I dressed much like you did in high school(graduated in "72). I was the introvert who never broke rules who decided enough was enough when in 1970, it was so cold that our school water tank partially froze and sported icicles for a week. I wore pants to school, and the next day, a lot of us did. The logical procession was jeans, but when I showed up that spring in my cousin's hand-me-down cutoff jean shorts, everyone was convinced that the summons to the principle's office would be forthcoming. No one said a word, and the hippie dress code soon was in full swing. It is interesting to me how I have had to actually find a style, after being a stay at home, work from home, mom of 3. There wasn't much extra for mom clothes with 3 kiddos, but when they all started moving on, I decided I needed a makeover. Took a LOT of mistakes before I settled on what worked for me, as I wasn't completely sure what my role in life was at the time. Thankfully I have finally settled on a style that works. None of my children went to school requiring uniforms, but as they attended a rural public high school, snobbery regarding clothes wasn't as bad as in some places. Good luck with the shingles, my poor Dad had them about 12 years ago and has recently had a flare up. He usually doesn't complain about ailments, but that affliction is the worst, according to him. Speedy healing! My mum raised four of us as a single mum… she always said her taste was way ahead of her budget. Must have been difficult to make the transformation from working/staying at home to finding a style and building a wardrobe… but fun at the same time. School uniforms are compulsory here in Australia and it seems to work fine. Kids are kids though and it’s amazing how ingenious they can be when trying to rebel against the rules. Dangling earrings, makeup and goodness knows how many variations on how to wear socks �� we also have free dress days and as an ex-teacher I can say we have exactly the same issues that you experienced in Canada. I also love a good well cut jacket with jeans or trousers. If only our winters we longer I’m sure they would become a wardrobe staple for me. Too me they just take an outfit from ok to we’ll put together. Rebelling against the rules is a kid's job, isn't it? Didn't stop me from rolling my eyes as a teacher. Ha. So sorry about your shingles. I wore a school uniform in the early years (preK – 3, which really had no impact since I was so young. I did get sent home in high school for wearing culottes, which was silly since they were much more modest than the short skirts we wore. I could not wait until college so I could wear pants! My early career clothes were suits and hose so it wasn't until I became a college professor that I actually created a style for myself. Today it is much like yours — jeans/trousers and a nice top with a jacket when practical which isn't often in Florida! The rules don't always make sense, do they? Uniforms here. But they have become a bit more sensible since I was at school. In winter a gym-slip (?) was a mission to get into with a side zip, and a shirt and a tie I battled with. Summer hat, and winter hat. High school was an evil bottle green I loathed, but primary was royal blue which I still love! It was school uniform for me as well and we were creative. My husband also wore school uniform with a cap and he always tells how inventive the students could be by dropping the peaks of their caps in puddles and moulding them into a unique shape! My son, who also wore a uniform, would come home and then change into some colourful clothes (he was heavily into rock climbing) but as you say students do need to express themselves and as long as it is not dangerous or causing harm then I say let them be. Had to chuckle about your stories about the neck scarf and the boys' t-shirt. Obviously you haven't lost your humour despite suffering. My mum and I had a good laugh about her giving my tee shirt away. My young cousin as only 8 or 9. Tells me how darned skinny I was back then. Clearly I developed my personal style by dint of overthinking and overworrying for a couple of decades, and then writing about it for a couple of years;). I love your uniform/looks. Just a simple message today. Wear those bootleg jeans! They look a.mazing on your long and shapely legs. They look awful on my stumpy misshapen short legs but they were designed with legs like yours in mind. Oh and I didn't wear a school uniform but wished I had, it takes the pressure off child, parent and teacher, IMHO. Hugs, have a blessed week, x. Your legs are NOT stumpy! No uniform at primary school then after the 11 plus exam I wore navy skirt or gym slip with white shirt, navy blazer and a tie in high school. We also had to wear navy heavyweight berets and not in a jaunty way! We weren’t supposed to eat food walking along the street in our uniforms either. Those who ‘failed’ the 11 plus went to a technical school or secondary modern and didn’t have to wear a uniform. I have never thought about why that is before. Cost presumably, as uniforms, especially the horrible blazer had to to be bought from an accredited shop and were quite expensive. It was pretty hard on my parents who had 2 children to outfit and not much spare cash. I look back on photos and we did look smart, especially in group shots. Navy is still my favourite base colour and I dress in a classic way so it didn’t put me off. Funny that now everyone seems to think uniforms are the most cost effective choice. But I wonder what the kids who failed the test thought about being the ones NOT in the uniforms? The school where I taught K-8 (in the US), instituted a "uniform dress code" about 10 years ago. Students are required to wear Khaki bottoms: skirts, pants, skorts, etc; and red, white, or black button shirts. They can wear sweaters or sweatshirts in red, white, or black if they desire. The parents love it because it is so inexpensive, they can buy items in these colors in inexpensive box stores. The school allows students to add tights, belts, bows, etc. to their uniforms. It has solved so many clothing problems at the school with student wearing t shirts with inappropriate wording or images. What an interesting post. Certainly food for thought pertaining to school uniforms. Also from NB, I did not wear a uniform to school. I can vividly remember walking into my high school one bitter cold morning, just off the school bus and meeting the principal in the hall. He pointed to my pants that I was wearing under my skirt and told me to go change! I was a very shy teenager and the last thing I wanted was to be noticed in this way. How times have changed! Oh and I was also the girl that dreamed of going braless. I was very tiny in high school except for my breasts. So we all have our hang ups. LOL As far as my style goes, I'm still working on that. Always a challenge for me to find clothes that fit well and I'm comfortable wearing. So sorry to hear you have shingles. I hope you feel better very soon. I remember being pointed out in an assembly about dress code in grade nine as being too adventuresome with my clothing choices. I think the comment by the principal was about how I wore a long dress one day and a very short skirt the next. I was mortified to be publicly called out. But it did give me (a very shy girl) a bit of street cred! Hope you are getting better each day! Going for my shot this week. I’ve seen the uniform issue from both sides. I wore one in secondary school and loved it. Forest green blazer, emblem on the chest pocket, with plaid pleated skirt, knee socks, white shirt, loafers-done and dressed by 6:30 each morning. As a teacher many years later, I was on the rules committee for the high school and also for the teachers with the union. At the time, the biggest concerns were the shortness of the bottoms or tops. A big issue was t shirts with obscene or vulgar sayings and wearing pajamas! Like you say, when May rolled around the battles would start. Although the uniform issue goes round and round, and there are arguements for and against, it certainly made my life easier for a few years. And I’m thinking…how would we visualize Harry Potter if not in his Hogwart’s uniform? The slogans on tee shirts which support drugs or violence or have profanity are banned in school here too. Lots of thoughts pertaining to school uniforms! I did wear a uniform in grade school but did not in high school. I was very happy to be free to express myself and probably pushed some “appropriate” boundaries. But cannot remember …..hehehe…. And kids can be mean. So I think school uniforms are a good idea. I didn't have to wear uniforms, but my brothers did. And my niece and nephew did recently. I remember my brother was relieved by them, since my nephew was really picky about clothes or labels that "itched" and he was a nightmare to get dressed in the morning. So the uniforms (that passed the itch test, apparently) were a godsend. As one of the two last girls to get a bra, I took some ribbing in Jr. High. And then, of course, when I got to college I went with the trend and stopped wearing one. There are a few pics from that era that suggest that wasn't a good look for me. ha! Your jackets and jeans are great on you throughout the years. And that bomber jacket you won is just fab. I started reading your blog about that time and remember being insanely jealous. I couldn’t help but think how fashionable those jeans would be now … and your jacket! I’m sure I’ve mentioned this before, but having worn a uniform for years, at 16, in the Sixth Form, I vividly remember my Sociology teacher commenting on how we’d complained about our uniform for years and when we could finally choose what to wear we’d developed a “uniform”! Sure enough, every member of the class was wearing denim! As to how my style has evolved … I think it was good pre children, then I struggled, when they were small or maybe that was just the 90’s 🙂 I’m not sure, but I’m definitely much happier now with my style than I was in my 30’s and 40’s …. Its good to read your views on uniforms, as a teacher … very different from any teacher I’ve known but I definitely agree with you! Ah… but see it was a uniform that you chose. Which makes all the difference, I think. My sisters and I attended a high school that required uniforms. They were comfortable, easy to keep clean, and attractive, if a bit plain. We liked that the uniform identified us as students from our school, which set high standards for education and behavior. Wearing the uniform saved time in the morning, and eliminated the frustration of deciding what to wear each school day. It also saved money, so we could spend our clothing allowance buying special outfits for dates and important occasions. I think this teenage experience has affected the way we (and our classmates) dress as adults. We have small wardrobes of dignified, classic, and well-made apparel. I think our views are the result of our different cultural experiences. In large US cities, uniforms were usually worn by the students of religious schools, not students of elite and expensive institutions. Most students at my high school came from families of modest means. I and many of my fellow classmates needed to work after-school jobs to help our families afford the tuition. One of the reasons we were proud of our school uniforms is because we and our families had worked hard to achieve the educational experience the school provided. I agree, Jo. Growing up in New Brunswick where parochial schools had been done away with we had public schools, and a couple of expensive private schools. It's much the same here in Ottawa, although we do have a Catholic school system and a few other private religious schools, but the uniform still marks out kids as attending the couple of expensive private schools in the city. But mostly what I was referring to in the post was the idea that some jurisdictions are saying that uniforms will help cure what ails education and the data just doesn't support that. I can certainly understand from your perspective that you'd feel the polar opposite to me about what the uniform itself signifies. All this makes me recall a letter from the principal to all the high school parents one spring when hot weather really got going……he said something like "if you are uncomfortable with how revealing your child's choice of school clothes are, imagine how I feel"…. At the time I was pleased that he didn't single out girls – it was the era of boys with the tops of their undershorts showing above their very low riding jeans, over revealing clothes were certainly not limited to the girls! There are no school uniforms in this country, but I remember how private schools in Peru undermined the unifying purpose of a national school uniform (dark grey and white for everbody) by obliging parents to buy their children's uniforms at certain shops, so the material and make of the clothes would serve as marks of social distinction. In general, school uniforms always were a cost factor for poor parents, because even the cheaper variety was more expensive than other clothes and often was of bad quality and would not last very long. In my research I read many times the idea of identity and/or inclusion as being one reason for uniforms. But one person's inclusion is the exclusion of someone else… I've always thought. Such a tricky topic, the school uniform. We have them here in the UK, usually up till sixth form (as it used to be called) and there is a wild diversity of styles which manage to mark you out very easily. There is too much banning of skirts and/or enforcing of skirts while actually avoiding the central question of how much leg is enough and how much starts to ring alarm bells. Also: how boys should comport themselves around girls. The focus is usually around girls' bodies, not boys' behaviour. No change there, then but I hope to see an end to this. As far as those teenage photos go – we all have similar tucked away and somehow it is always the hair that stands out for attention. Was chatting only the other day about my solid wood clogs with totally inadequate PVC upper which meant that my feet were always sliding about as I clop-clopped my way about town. I looked like I was standing on two bricks. Would I be 16 again? Only for the skin tone. Hope the shingles are being beaten into submission. Those cheap wooden clogs… I remember those in the seventies. How many blisters I endured! A bit late in replying to comments. That site does sound "nasty", Brenda. Hope that you are much better! Thanks, Dotoressa. I can't imagine wearing my bathing suit off the beach. It's hard enough to get me to wear it on the beach. Ha. No uniforms at my schools – and we did have a dress code. And as you mention, it was aimed at girls. I do remember my friend being sent home for wearing a "keep-on-trucking" t-shirt. My poor Dad had 4 girls; he detested the cut-off jean shorts we loved so much and refused to let us wear them. We fooled him (maybe? He was pretty smart). Easy solution – peasant skirt on top, whipped off when we were out of sight of the house, and voila! Short-shorts. I went to a Catholic school up until Grade 9, so I remember the plaid school uniforms. It did make dressing easy! I love your variations on a theme, the jacket or sweater, jeans and cute top. We had a dress code that i remember in high school. I do love your olive jacket and what a fun picture of you with your curly hair. Never thought of the uniform as an equalizer in that way…. everyone hating it. Gave you an excuse to not like what you were wearing without the responsibility of having chosen it. Not sure that makes sense. I'm on pain meds for the shingles and feeling muffle-headed. Thanks for sharing your perspective as a teacher regarding school dress codes and uniforms. Fascinating read. Thanks. And thanks for hosting the link-up. I attended school from 1969 to 1980 and all schools I went to had a pretty strict uniform policy. After school: I still layer V-neck sweaters over skivvies or lightweight turtleneck sweaters and hate wearing neckties of any sort !